This chicken burrito bowl is the ultimate chipotle copycat! It’s whole30 compliant, paleo, and AIP. There are few things are universally popular and beloved here in America than Chipotle is. Everyone is obsessed with Chipotle. And for good reason! The food is good, easy, convenient, and mostly well sourced. However, it’s not necessarily the most AIP friendly spot with all of the nightshade spices in the food. And regardless of whether or not you can have nightshades, a whole30 and paleo compliant copycat for a chipotle favorite is still an amazing recipe option to have on hand! 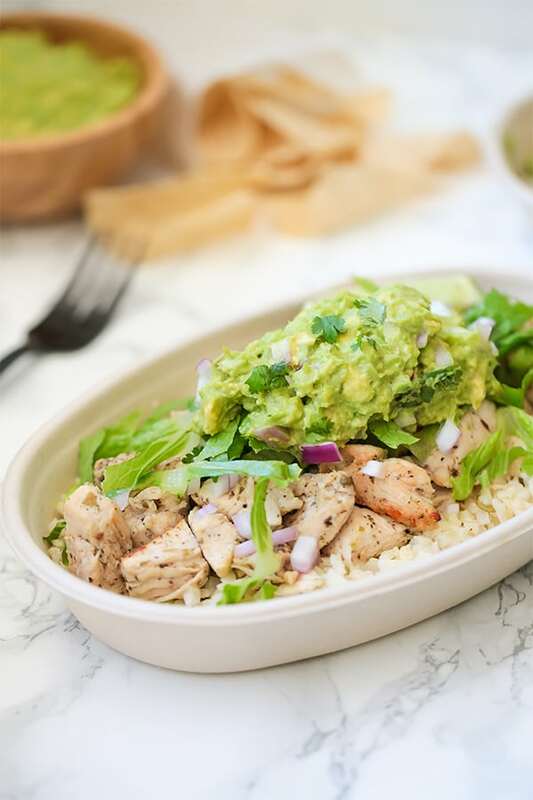 This chipotle style knockoff of a chicken burrito bowl will make you seriously nostalgic while still feeling amazing! It’s fairly straightforward to make at home, and it’s packed with veggies, healthy fats, and protein! I actually polled my Instagram followers to see whether or not they’d prefer a chicken or carnitas burrito bowl, and chicken won! You could swap the chicken for carnitas by using my recipe here. This is for the signature chipotle style cilantro lime rice. You can also use green leaf lettuce, but romaine is the standard chipotle burrito bowl ingredient. It’s not chipotle without guac!! Adds a spice to the guacamole. If you eat nightshades, sauteed bell peppers would be a great addition to this bowl. However, my house is a bell pepper free zone since I react so badly to them. I made sure that this burrito bowl stands alone without the bell peppers as well! This burrito bowl is the perfect chipotle copycat! 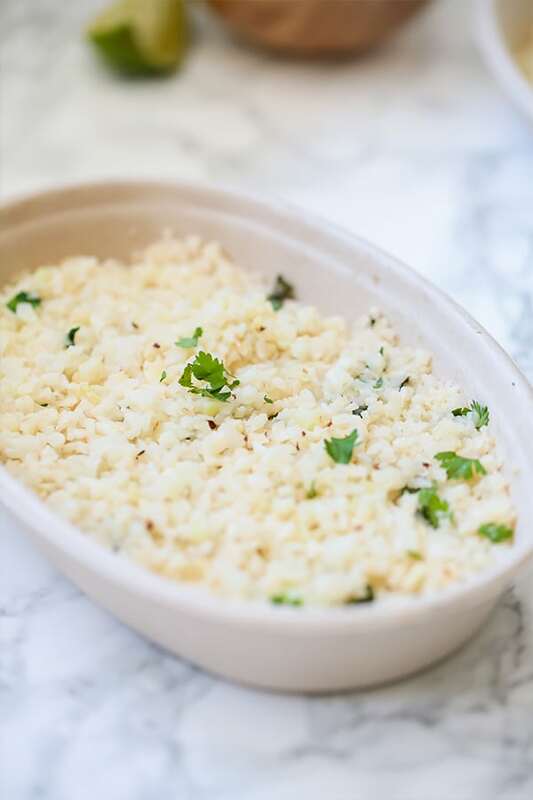 Using a large skillet with a lid, heat the avocado oil over medium heat and pour in the cauliflower rice. Lightly saute for 1-2 minutes. Stir in the bone broth, and add the salt and bay leaf. Simmer on low heat with the lid on for 3-4 minutes. Remove the lid and the bay leaf. Saute for another 3-4 minutes. Mix in the fresh cilantro, and lime juice and layer the rice on the bottom of the burrito bowls. Using a large skillet, heat the avocado oil over medium heat. Season the chicken (reserving the cilantro) and cook in the avocado until internal temperature is 165 F. Allow to cool slightly. 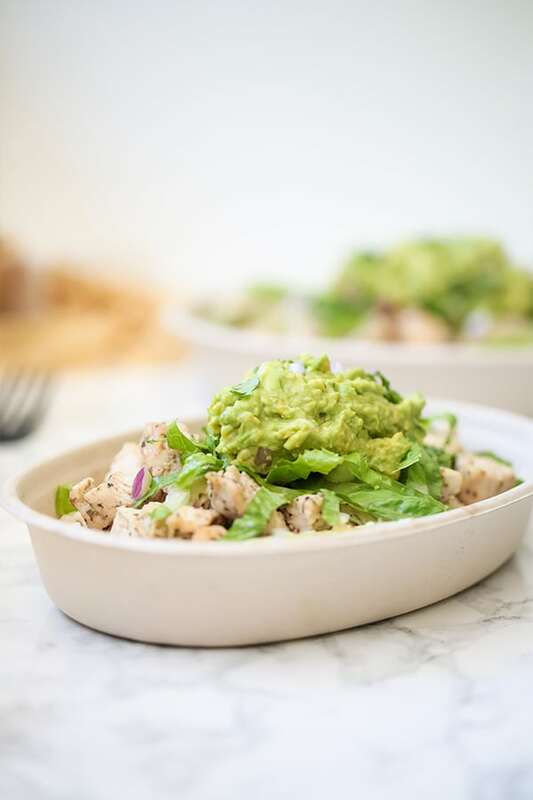 Add the chicken to the burrito bowls and layer on the red onion, romaine lettuce, cilantro, and guacamole. Serve immediately, or save for later! 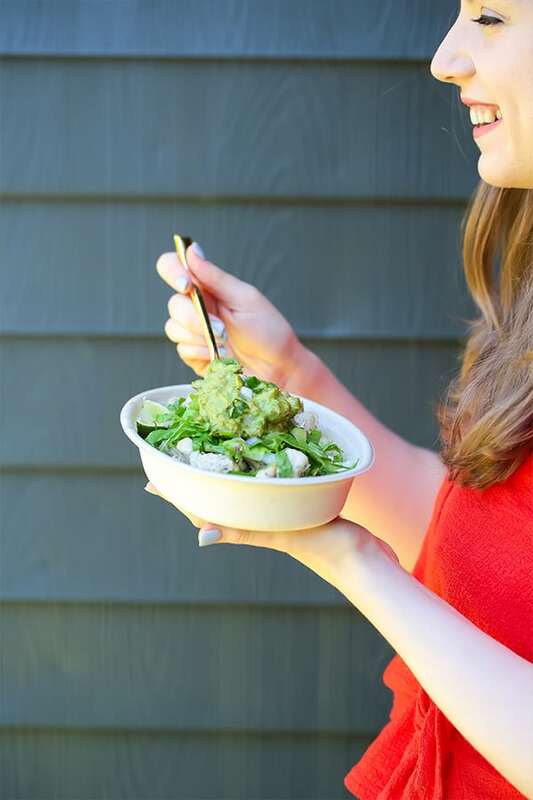 Reserve the guacamole and store in an airtight container if saving for later. Combine all of the ingredients in a medium bowl. Season with more salt to taste if desired. Yummy! So good, easy and much cheaper than the beloved chipotle. Thanks Michelle! Made this for the second time tonight. Soooo good! My husband likes it too!